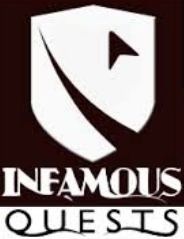 Infamous Quests was founded in 2012 by Steven Alexander and Shawn Mills, to release commercial adventure games. They previously released fan remakes of Sierra adventures under the group name Infamous Adventures. A fan remake of Space Quest II with mouse control, voices, improved graphics, music, and sound effects. A fan remake of King's Quest III with mouse control, voices, improved graphics, music, and sound effects.